Sept. 31, 2017. Pat Farenga delivers a keynote address at the Clonlara School's 50th anniversary, 11:30 to 2:30 pm, at Zingerman's Greyline, 100 N. Ashley St., Ann Arbor, MI. Nov. 29, 2017. Pat Farenga is speaking at the Encompass Community For Independent Learning at Friends Academy in Dartmouth, MA, 6 pm to 7:30 pm. For information, contact Elizabeth Gouveia, 978.223.8402. 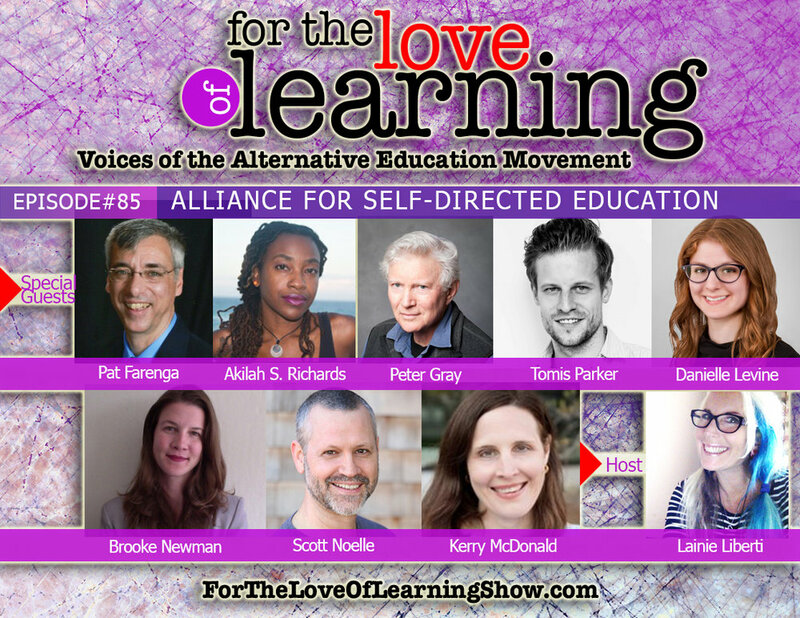 The Alliance for Self-Directed Education discusses its launch and goals on the For the Love of Learning: Voices of the Alternative Movement show, Dec. 8, 2016 and updates it on the most recent show, Sept. 18, 2017. Wide Angle with Peter Bermudez, "Homeschooling: Myths and Possibilities," Dec. 2, 2016. USA Today, "Unschooling Takes Students Out Of The Classroom." July 26, 2106. Christian Science Monitor, "Free Range Education: Why the Unschooling Movement is Growing," Feb. 14, 2016. Pat Farenga interviewed by Fox News about unschooling. Today/Associated Press, "School's Out Forever for 'Unschooolers'", 8/29/11. Pat Farenga and Heather Doney (http://HSInvisibleChildren.org) speak about child abuse and the regulation of homeschooling. The discussion was moderated by Antonio Mora, anchor for Consider This, a news program on Al Jazeera America. CNN: Dr. Drew Pinsky explores being an unschooling parent to help children learn versus being a Tiger Mom. Pat Farenga is the unschooling parent. An engaging, deep look at how a family decides to take their children out of school and how they arrived at the decision to unschool. Then the film shows how the family adapts to their new way of living and learning with their two children. Cevin Soling's powerful examination of what life is like for students in public school today, what can be fixed, and what should be abolished.